which igiftbag if right for you? STAY CONNECTED WITH YOUR STUDENTS AND ALUMNI WITH AN IGIFTBAG! We’ve raised the bar for sponsored digital gifts. We’ve included a creative gift option for every promotional and business goal your sponsors may have—whether to raise brand awareness, generate sales or educate customers. Sponsors create gifts for your igiftbag using our automated online tools called Gift Apps. And, they are as simple to use as creating an online party invitation. Our Gift Apps enable sponsors to create beautiful gifts—a discount offer, an expert download, an expo promotion, a giveaway, among others— in a matter of minutes and review and edit them in real-time. And, it’s just as easy for sponsors submit an order for custom gift designed by igiftbag if you want to include custom-designed gifts: Sponsors select their Gift App and design preferences, enter their gift’s details, upload brand images and receive a custom designed gift in a few days comparable in quality to a world-class interactive advertisement. Transform university publishing, professor research and insights, lectures and event content into edifying and informative gifts for alumni (book excerpt downloads, Tips, podcasts, video). Insert discounts and deals on school items from licensed vendors. It’s easy to integrate the igiftbag seamlessly into your sponsorship and partner sales activities. You can setup a sponsorship sales website invitation in a minutes to promote your igiftbag to all of your sponsors and enable them to learn about the igiftbag’s features and benefits, highlight key information about the sponsorship rates you elect to charge, and provide the online tools for them to instantly create their gift offer. POWERFUL CAMPAIGN AND GIFT MANAGEMENT. Create a sales page invitation page in minutes for your partners and sponsors to learn more about creating a gift. Send custom Gift Invites to them. Track the responses and progress of your partners and sponsors on your RSVP and Manage gifts dashboards. When you set up your igiftbag, you can add special event promotions and gifts from our selection of ten unique endurance event gift “apps.” Create your own event store inside your igiftbag, showcase your sponsors’ samples or a sponsor’s post-event celebration! You don’t have to rely just on your local or national sponsors to create great gifts. Every igiftbag can be fully loaded with “wrapped” gifts from our Gifts Catalogues from leading brands and media partners (discounts, deals, PDF expert tips, book downloads, expert videos, Mp3s). RAISE YOUR IGIFTBAG’S ENGAGEMENT LEVEL. As the pioneer of the virtual goodie bag in endurance sports, we’ve developed special techniques built-in to the setup and design to raise your igiftbags appeal and engagement level with your event participants. With igiftbag’s state-of-the-art analytics reporting, you can monitor the results of your igiftbag in real-time. Called “the best real-time reporting of a promotion,” your customized dashboard displays a ranking of your gifts and provides detailed results on click-thrus and click to actions of every item within your igiftbag, among other metrics. EASY SET UP AND DISTRIBUTION. 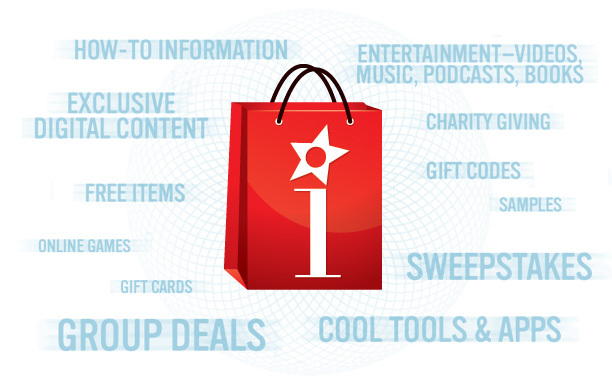 Set up your igiftbag in minutes and start the fun process of exploring all your igiftbag’s gift options. Distribute your igiftbag to your recipients with email tools that are as simple to use as as creating an online party invitation. Whether you want to send your igiftbag invite using igiftbag’s platform or your third-party email marketing provider, the igiftbag platform is fully integrated with the top email vendors to do both. ON-THE-GO, MOBILE “MY IGIFTBAG” ACCESS. SECRETS OF A GREAT IGIFTBAG. After three years of delivering virtual goodie bags for events, we know that a truly “ultimate” virtual goodie bag must exceed a physical goodie bag in creating an engaging, worthwhile experience—not be just be an online substitute for one. Here are two requirements. Can you fill in the blanks? 2. Raise your igiftbag’s ______ score! To get the answers to these and other gift questions, contact us to see a demo, receive a FAQ and learn more about what gifts could be inside your sports league and team igiftbag. THERE’S AN IGIFTBAG FOR EVERY ACADEMIC NEED. Perfect for: Alumni associations and groups. PTAs. Student Life and Activities Departments. Activity and team fundraising. Fan appreciation. Teams. Continuing education. School districts.